Visit the City of Light illuminated by the lights at night on board a double-decker sightseeing bus! This isn't just a double-decker sightseeing bus - it's much more than that! We're taking about a fabulous tour which lasts a little less than two hours, during which you will explore the City of Light whilst it is beautifully illuminated by the lights at night. Paris, which is also known as the City of Light, is the city of lights, of the reflections and shadows of the night. Visiting Paris, without enjoying its charms at night, would really be a shame. Thanks to this tour by night, you will be able to sit back comfortably and admire the sights from on board your air conditioned bus as it visits different neighbourhoods, bridges and monuments which are all brought to life by the excellent commentary on your Audio Guide (also available in English). Book your seat now at the truly exceptional price of €23.00: click on the button that says "Night Tour by Bus." 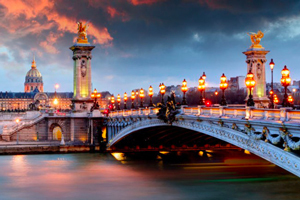 With this panoramic bus tour of the city, you will be immersed in the discovery of the French capital with an itinerary that has been designed to perfection, ensuring that you don't miss out on anything important. You will pass by the famous Place Vendôme, the Place de l'Opéra Garnier, the Louvre Museum with its majestic pyramid that is illuminated in gold by its lights, the Pont Neuf with its thousands of reflections, the Hôtel des Monnaies, Saint-Germain-des-Prés with all its illuminated premises, the Cathedral of Notre Dame, the Conciergerie and the Hôtel de Ville, the famous Rue de Rivoli, Place de la Concorde, the Grand Palais and the Petit Palais, the triumphal avenue of the Champs Elysées, the Arc de Triomphe, the Place de Trocadéro, the Eiffel Tower and the Madeleine Church with its columns which are reminiscent of a Greek temple. On a tour that takes approximately two hours, you will get to see the principal neighbourhoods and city monuments accompanied by the excellent commentary of your individual Audio-Guide. The itinerary that has been put together for this nocturnal tour of the capital is perfect for those who really want to get to know the city and the Parisian way of life. If you have limited time and your visit is only short, this would be a great idea for making the most of the time you do have without having to waste it getting on an off different means of public transport. In addition to this, for first time visitors and those who love to learn all the most intimate details about the place that they are visiting, this is definitely a tour that will ensure your memories of the French capital are really special. Available every day from 22:00 during the summer period and from 20:00 during the winter months.